Last year we asked for cloves to be used for a garlic cultivar trial to assess different growth parameters across multiple garlic cultivars. We received six hardneck and three softneck cultivars. So far this year, we have evaluated all nine cultivars on the rate of emergence, height and leaf count. The trial is set up in Mount Forest, ON in clay loam soil at the site of the Garlic Growers of Ontario Field Day, Saturday, June 16th, 2018. Early emergence was quantified April 3rd and since then some plants in each treatment have emerged. Music performed significantly better than most cultivars (Figure 1). Figure 1. Average early emergence of garlic cultivars as of April 3rd, 2018. Height and leaf number were assessed on May 14th (Figures 2&3). Music, Georgian Fire, Ivan and Newfoundland were the tallest cultivars and tended to have more leaves per plant. Figure 2. Average height in cm of garlic cultivars as of May 14th, 2018. Figure 3. Average leaf number of garlic cultivars as of May 14th, 2018. Future assessments will look at average weight per bulb and clove as well as number of cloves per bulb. 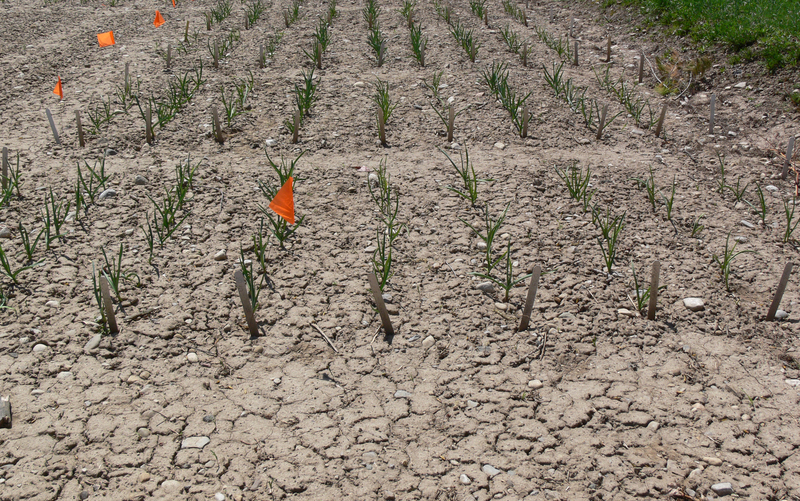 If you have a cultivar that you would like to include in the 2018-2019 Ontario garlic cultivar trial, please contact Travis Cranmer at 519 826-4963 or E-mail travis.cranmer@ontario.ca. We are hoping to plant several different cultivars at several field sites to assess varietal differences in response to soil type and climate. Figure 4. Plants at emergence April 3rd, 2018.